Once upon a time, not so many years ago, I got it in my head that I should write a book about Van Morrison’s music. I first fell for his voice – the way he works a note, throttling, caressing and everything in between – when I heard “Astral Weeks” in 1969, and I’ve been falling for his voice ever since. Back in the mid-’90s, the world on the Internet was just getting going. Van’s fans started a discussion group on a listserv, and all of a sudden, in one fell swoop, I was in the midst of a whole bunch of crazies just like me, who blather on about this weird place you go to when you listen to Van singing. I fit right in, and before long I was writing reviews of the shows and posting them to the Van list and then stories from the road with the fans. Over the years, I’d gathered quite a handful of these stories and show reviews, and it dawned on me: What the world needed right now was a book about a lifetime of me going to Van Morrison concerts – beginning in 1970 all the way up to, well, whatever year it was when I finished the book. It would answer, finally, the question I’m always asked: So how many Van shows have you been to? I never know the answer; at some point, it was just easier to stop counting. But if I wrote them all down in a book, we’d have the definitive answer. I began writing the Van Chronicles in earnest in 2007, type type type type type, and by November 6, 2008, I had covered the first 30 years. Only 10 more years to go! But for now, I was closing down the computer for a few days … I was off to Los Angeles on November 7 to see Van Morrison in concert at the Hollywood Bowl, to perform live, two shows, for the first time ever, “Astral Weeks” in its entirety. Holy Toledo – Astral Weeks is where it all began for me. What perfect synchronicity: The Van Chronicles opens with me hearing Astral Weeks and Van for the first time back in the ’60s, and now I had the perfect ending to the book: close it with Astral Weeks live 40 years later. It turned out that those two nights in Los Angeles were just the beginning of a full year of Astral Weeks Live shows, and that meant no time to write – every spare moment I had, I was working to pay back the college fund I’d been borrowing against to cover the bloated entertainment budget. 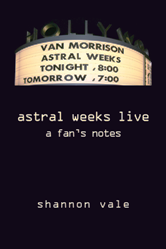 When I finally got back to writing, I started in on the Astral Weeks Live chapter, and the rest is history: That chapter became a book, Astral Weeks Live: A Fan’s Notes. In the meantime, the Van Chronicles has been collecting dust on my hard drive, going nowhere. I am absolutely certain that the world does not need a second book about the music of Van Morrison as told by Shannon Vale. It’s quite possible that one book might have been too much, but two is just plain silly. And more to the point, I have moved on to working on my next book, which has nothing to do with Van or music, so my Van Chronicles will remain unfinished. And that’s OK with me. But instead of having those 30 years of Van appreciation sitting around doing nothing, I’ve decided to unleash them on the world, here on my blog, in a serialized fashion. It ain’t why, it just is.